Full disclosure: We were provided a discount by Citroen Europass Australia for our leased vehicle. In exchange, we agreed to provide details of the Citroen Europass program and benefits, and also add links to their website within this article. When we decided late last year to come over to Europe to visit family and do some exploration for a few months we already knew that we wanted to do it by van. It is our forth time back in the “old country” and we were under no false illusions that owning and driving a vehicle in Europe would not be as easy as we have it back home in Australia. But we also knew that there would be so many hidden spots to hike, surf or photograph off the beaten path that simply wouldn’t be easily or cheaply accessible by public transport – as great as it is! But the question was, should we rent, lease or buy a van for ourselves? What would be the best option in terms of bang-for-buck and simplicity? We planned to visit for around four and half months and we wanted something that wouldn’t break the bank, that would blend in when parked in urban areas, and still have enough space inside it to sleep and store our gear. As a bonus, we also have immediate family living in Europe that were willing to help us find, register and insure a vehicle if we bought something. In standard fashion, we spent many late nights trawling through websites, online forums, facebook groups and sending out dozens of messages and emails to just about anyone that would give us a some tips or information. 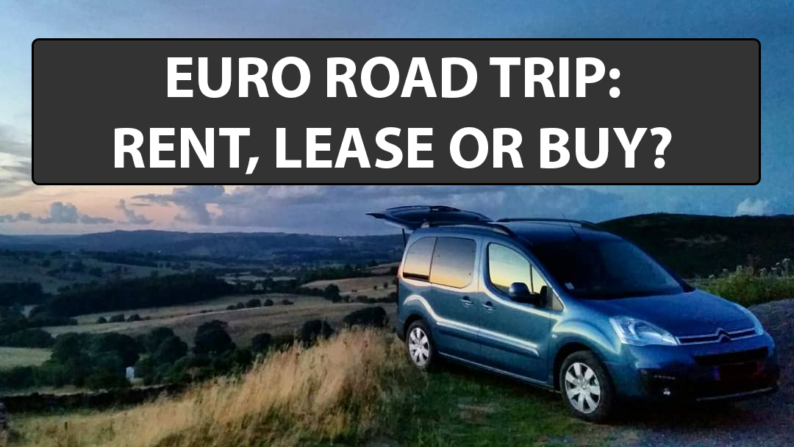 After a few weeks of research and discussion, we came to the final conclusion that leasing a vehicle was the best option for our planned trip – even though we had the funds to buy, then sell, a vehicle! So how did we get to that conclusion? Renting a vehicle in Europe is generally quite expensive for longer periods – most companies weren’t interested in providing a discount for longer use. Once we factored the rental fee, unlimited km fee, insurance and other fees, our quotes ranged from $4,500 to about $15,000 for three months; depending on the vehicle and insurance options. Renting a campervan was particularly expensive. Leasing a French brand vehicle through their various tourist leasing schemes, such as a Citroen, Peugeot, or Renault, offered brand new vehicles and significant discounts for longer periods. It just happened that 90 days was the threshold for the daily multiplier to drop by a significant amount – so it was significantly less expensive to lease a vehicle for 90 days than 89 days. The lease fees also included unlimited km, Europe-wide zero-excess full comprehensive insurance (a must have on those narrow country lanes), and free road side assistance. Quotes ranged from $3,200 to about $8,000 – again, depending on the vehicle, fuel and transmission options. Diesels are more expensive, and automatics also cost a fair bit extra. An unplanned benefit was also that Citroen had multiple locations around France and Europe to collect the vehicle; including a pick up location just outside of Geneva, Switzerland, which was just a short drive or train trip from where our family currently live! The main downside of the leasing scheme was that these were brand new vehicles which we couldn’t chop into or make permanent modifications, and we were also limited to the models that we part of the lease program. Buying seemed to be the best option on the surface – that’s what friends of ours had done with success, and it’s also what we did when we spent four months travelling around Chile and Bolivia in 2015. But the problems arose when we came to the logistics and practical considerations. Because we were foreigners with no local driving or insurance history we found that getting even the most basic insurance would be very difficult and expensive. The few companies that did provide quotes all had outrageous excess claim fees because of our status. Registration, even with family to help by providing an address to use, was also filled with red tape and hurdles as we weren’t registered residents of any country in Europe. It could be remedied, but not quickly or easily, or without some aspect of fraud. And finally, the reality that finding, buying, registering, insuring, converting and then selling the van would take up a significant amount of time from our trip. In Chile we spend almost three weeks securing, converting and then selling our car – and we were stuck in Santiago the whole time and having to pay rent when we should have been on the road enjoying our trip. There was also the consideration that many older, used vans are generally not well treated or maintained, and any breakdowns and repairs on the road would come out of our trip budget and cost us more time. Quite simply, it just wasn’t worth the time, effort and money that we would have to invest into buying a vehicle if we were travelling for less than six months. Renting was too expensive and restrictive for the type of trip we wanted to do. But leasing, specifically through the French tourist scheme, was the golden ticket! 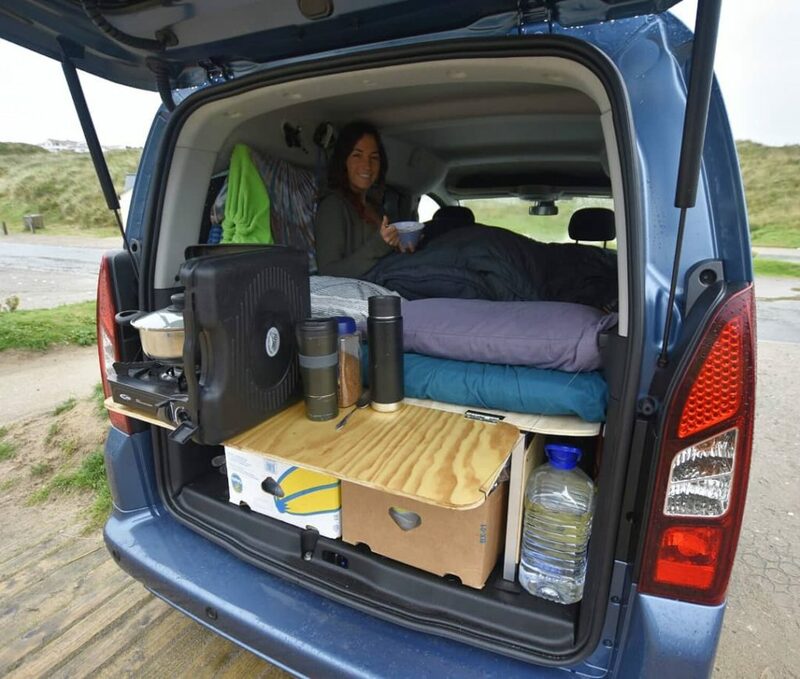 We spent some time researching camper fit-outs of various small minivans and van-lite Multi Purpose Vehicles (MPVs) and came to the conclusion that a MPV, such as the Citroen Berlingo, leased directly through Citroen Europass Australia, would be just large enough to house a basic bed frame and space for food, water and our gear. It also didn’t hurt that we have designed, built and travelled in small vans and wagons (such as our Corolla wagon and our Montero Sport) in the past. We knew that it’d be tight, and there would be some concessions, but we also knew how useful it would be to have a more compact and fuel efficient vehicle in Europe. We’ll talk more about our trip costs and budget in a future article. Months later, as of the time we write this article, we are still 100% sure that we made the right decision. So what about you? Have you travelled around Europe with your own vehicle? What option did you take and how long were you on the road? Remember to check out our YouTube Channel – Comfortably Lost for more videos discussing these and other topics!